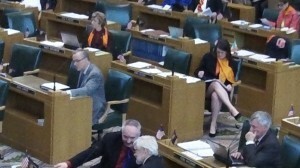 Oregon legislators in session last spring. Will they take a lesson from the Colorado recalls Tuesday? In Colorado Tuesday, voters in two state senate districts recalled the Democratic office holders — one of them the Senate president — over their votes for two gun-related bills. The outcome is of interest in Oregon, where all Republicans and a handful of Democrats in the legislature were wise enough to kill bills on gun control this year. Colorado Democrats were not that restrained. Without any Republican support they passed laws limiting ammunition magazines to 15 rounds and requiring criminal background checks for all firearm transfers, not just commercial sales. The Colorado recall elections are of interest for two other reasons as well. Like in Oregon, most elections there are done by mail, but these recalls were held only at polling places, meaning that only people who cared about the issue and the outcome took part. That’s how all elections should be held, but Oregon is unlikely ever to fix its mistake of holding elections only by mail. From Ray Kopczynski: I absolutely concur about the going to a polling place to vote. While vote-by-mail may generate more “votes,” I can’t argue they are more intelligent votes.